Brightly colored fabric strips make up the simple blocks in this eye-catching quilt. It's a great way to add color to Baby's room. 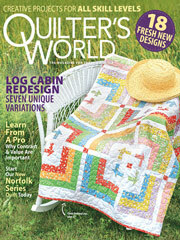 This e-pattern was originally published in Weekend Quilting Wonders. Size: 50 1/2" x 55".